Rivers are story-tellers; the Brahmaputra is no exception. Just as their waters carry the filaments of earth to deposit at will along their changing course, to become the fields of the farms on which our houses are built, so rivers carry ideas. Thoughts are shaped and rearranged at their own meandering pleasure. From its broad sweep across the plains of Assam to the teardrop islands of the Bangladeshi delta, the Brahmaputran currents flow with legend. An actor to a tee, even its names are many: Brahmaputra, Jamuna and ultimately part of the Meghna, from the mountains to the sea. In the south, on the island of Hatiya, the legends collect like silt and focus on a name: Kamrup-Kamakhya. By the time we reached Guwahati and the start of the first visit to Assam for both of us, Situ was settling into India and enjoying each new discovery, as of course any traveller would. I enjoyed the wonder of his wonder. We visited the major sites, the temples: a small ferry took us to the Umananda Mandir on an island in the river; the priest at Navagraha Mandir gave prasad or blessings amid a troop of monkeys prancing about inside and out; and by bus we reached the important Kamakhya Mandir. The Kamakhya Temple is itself a place of legends. One version of the principal legend is as follows: once, when the goddess Devi Sati's father King Daksha organised a blessing ceremony called a yagna, he did not invite his daughter or her husband Lord Shiva. At the insult to her husband Sati jumped into the ceremonial fire and killed herself; and on seeing her dead body Shiva became enraged and commenced the dance of destruction, the tandav. With the Earth on the verge of destruction, Lord Vishnu with the help of his chakra started cutting Sati's body into pieces which fell across the country. It stopped Shiva's dance and the world was saved. 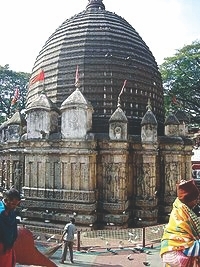 The places where Sati's body fell are considered centres of power by Hindus and Kamakhya Temple is said to be where her reproductive organ fell. Similarly, Kalighat Kali Temple in Kolkata is said to be where the toes of the right foot fell and Sitakunda Chandranath Temple near Chittagong is said to be where the right arm fell. There were two things that excited Situ which I didn't appreciate. 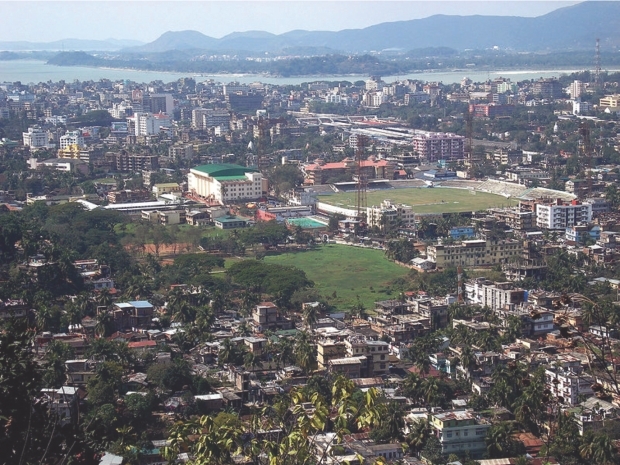 'Kamrup is a district!' he'd said with elation, and 'Kamakhya is a temple!' I'd asked why he was so taken with these two place names. 'I'll tell you later,' he said and I'd left it at that. I didn't imagine he wasn't telling me because it involved superstition, something he wouldn't normally pay attention to. He was a bit embarrassed. We took a day to visit the 'Poa Mecca' mosque east of Hajo. He was strangely insistent he wouldn't be able to say prayers because he didn't have a topi or prayer cap to wear. I bought him a cheap one from the street. It was then he confessed: in Hatiya he went to the mosque irregularly so was unsure he would know exactly what to do! “Well how do you do it when you do go to the mosque in Hatiya?” I'd asked. “I follow the others,” he said. The night before our trip to Hajo he practised in the hotel room how to do his prayers. It's not as if I could shed any light on it. The mosque was really memorable for two reasons: because unfortunate Situ couldn't concentrate on the namaz he was performing inside from imagining me outside laughing that he wasn't sure how it was done; and because of the Imam, who afterwards gave a special blessing to us both and then said to make sure we visited the Hindu temples in the town before returning to Guwahati. One of those Hindu temples had been built on the ruins of a Buddhist temple before it. In West Bengal and again in Assam we'd seen the tolerance and intolerance of India: one religion's destructiveness towards another as well as beautiful cohabitation. In particular the Imam directing us to the Hindu shrine was an enlightened gesture. A few weeks later Situ and I crossed the vastness of the Meghna, three hours it took, from the mainland to Hatiya on the rusty but sturdy vessel they call the sea truck. Hatiya is fashioned by the river: there are few better places to appreciate the power of nature than standing at Hatiya's riverbank and watching the erosion. A few days in Dhaka can mean the tea shop with the water views where you had your tea before you left is now in the river, or moved elsewhere in the market. Meanwhile on the southern shore sediment grows Hatiya ever larger. By the light of the kerosene lamp in the tea shops, Situ would relate our journey to our friends: and they were fascinated. For hours he would talk and show photographs, about Poa Mecca, riding elephants and wild rhinoceroses: all our Assamese adventures. But when he said we'd been to 'Kamrup-Kamakhya' the villagers were entirely astounded. In Hatiya from time to time come travelling salesmen, with bags of tricks and special powders, with various potions of dubious merit in attractive glass bottles and sometimes a cobra or two to charm, for advertising purposes; always they have tall and fantastic tales to share; entertaining with loud voices and wild claims, they draw a crowd and drum up sales. 'In Kamrup-Kamakhya,' they say, 'there is a magical bucket and if you step inside it you can fly to anywhere in the world!' 'In Kamrup-Kamakhya,' they say, 'there is a lion on an island in a river, and if the lion roars…' well, a certain part of the male anatomy falls off! For Hatiyans, Kamrup-Kamakhya is a mythical place so far away that anyone who goes there never comes back. Thus when we said we'd been there, some of the locals looked at us as though we'd just conquered Everest. The Hatiyan Hindu community were particularly interested in the Kamakhya Mandir, which no one seemed to have known about previously; yet soon enough our pictures of the place, and the other mandirs of Guwahati featured in several of their homes, stuck into the thatched walls or decorating home altars. Situ goes to the mosque regularly these days; he now performs his namaz quite easily and he's made to stand in the front row so there's just no scope to copy. It's the talk of By-the-Big-Bridge. I suppose like the rest of us he got older. We still remember the Indian trip, now and then, on Hatiyan evenings illuminated by solar power. Shaped by the seasons and carried by the river are ideas. A little bit of fact gets scattered as the river negotiates southwards. The Brahmaputra – Jamuna is a legend-shaping river that silently deposits stories as sediment in the Meghna's delta islands.